So that’s it for the close season then. You may not have noticed we’d had one; football having been funnelled into our eyeballs pretty much non-stop since I reported from H&W’s low octane season denouement. From the Portsmouth/Cardiff final, where our chums down the road stole our FA Cup thunder somewhat, through the seemingly endless series of Football League play-offs, to Euro 2008 which ruined the summer for the more nationalistically-focused England fans, particularly those who like to set their watch by Coronation Street. That’s it now though. You’ve had your ‘break’, and we’re back into the domestic stuff. July: a month for lying on a towel in Magaluf reading transfer speculation in a day-old copy of The Sun. Except not for everyone; those of us who don’t enjoy Magaluf, The Sun or towels, and really care not a jot which ‘Madagascan Michael Owen’ is supposedly going to pitch up at Wigan, have to rely on the delights of pre-season. Pre-season ‘campaigns’ seem to get longer and longer, interminably approaching the opening game of the season proper like a nervous slug attempting a ski-jump on a sticky ramp. 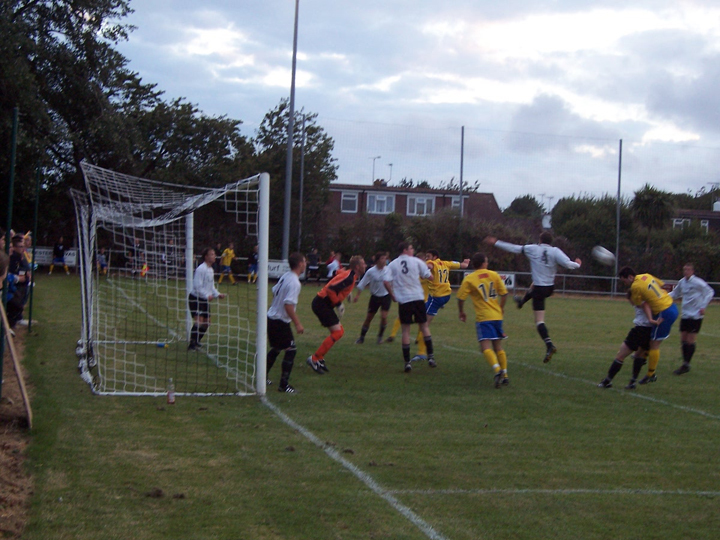 Pre-season friendlies are, after all, the enemy of exhilaration. Friendlies look at giddy thrills through tired pill-box eyes, grunt and then roll over, wrapping themselves up in all the duvet as they do so. So, in the face of an entertainment hostile to the very concept of entertainment, one has to make one’s own adventure and, thus, containing the early July stroller in an obscure Sussex County League location at least gives it an element of exotica. The first friendly of the season is always fairly good though, as it allows everyone to re-group, not just the team (although there’s been plenty of traffic in and out, so its more like a particularly athletic form of speed-dating for them) but for us supporters. During the course of the season you spend an awful lot of time in the company of your fellow fans so, come the end of the season, we need that couple of months off to recharge our social batteries. In a way pre-season is a good rehearsal for us too. If we started the season instantly with a big beano to Worcester City, we might well collapse prior to kick-off, but we can ramp it up too, with some balmy summer evenings, light drinking and the beginnings of excited chatter as to our prospects for the coming season. That chatter was paramount; the hellos and how-ya-bins essentially our focus, and around it a game of football broke out, but not much of one. 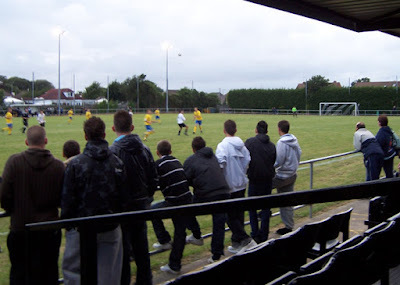 These games are always glorified training sessions and while its good to get a sneaky look at new signings, eager trialists and the Academy yoof getting a rare chance to mix it with the ol’ ‘yins, it is hard to prevent your attention from straying. 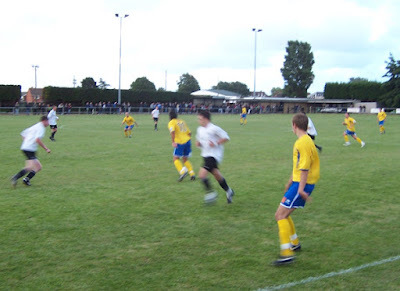 As a result, I missed the only goal of the game (scored by trialist Danny Edwards – I used to work with a Danny Edwards who was fairly nifty at football – it couldn’t be, could it?) by remaining in the bar slightly too long after half time, as my compadres and I chewed the fat like committed carnivores happy to substitute their gum for gristle. You know though, we always knew how it was going to be. This was, after all, a friendly arranged so that our assistant manager Charlie Oatway could begin his on-field rehabilitation by kicking his son, East Preston’s Charlie Jr., around a pitch for a half. Perhaps Jr. hadn’t been doing his fair share of the chores, or had been lippy to his Ma at breakfast. While some kids get grounded, or have their iPod confiscated for a week, Charlie Oatway Jr. has, instead, to deal with the possibility of his old man leaping in studs up and breaking his shiny new birthday shin-guards. That’ll learn him. So, not a scintillator then, but its always worth it, of course. It might be a long old way to come from London to deepest Sussex for an uncompetitive game, especially missing the sole highlight but, y’know, screw it, its all part of the process of training up the concentration for the undoubtedly intense season to come.